When I first heard that there was a Zelda escape room coming to the United States, I imagined a labyrinth of elaborate puzzles, growing more challenging and complicated with each subsequent chamber. I did not expect to be solving brainteasers at a conference table. But I am pleased to report, dear Kotaku readers, that my group saved Hyrule, even if it was a little lame. On Friday night, I brought my fiancée and two reluctant friends to Defenders of the Triforce, which operated in New York City over the weekend. Scrap, the company behind the Zelda escape room, provided our tickets—otherwise we’d have to drop something close to $200 for all four of us, which is absurdly high considering what we got. Right away you could tell that the organizers were stretching themselves a little too thin. 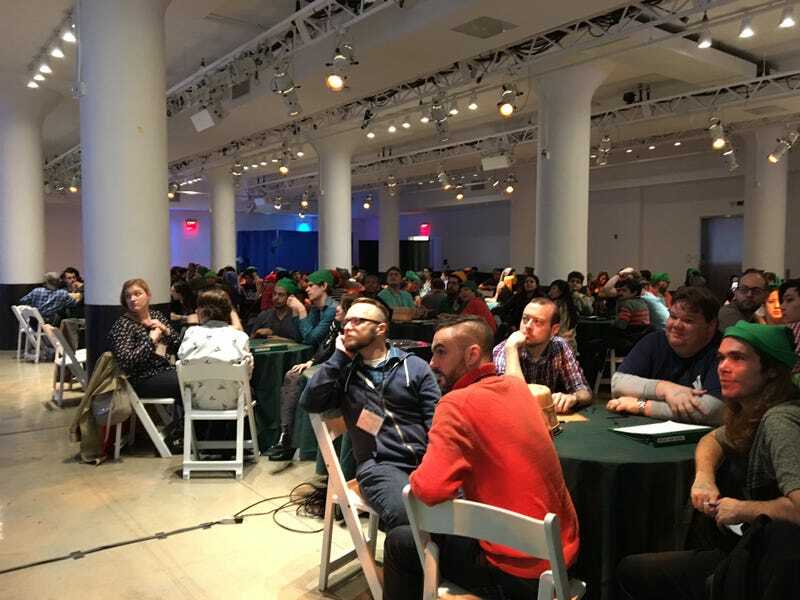 Photos from earlier months’ events showed a room full of classic green caps, but by the time they got to New York, Defenders of the Triforce had presumably run out, offering just one hat per table. This was a huge disappointment to those of us who wanted to force our friends to wear floppy hats. The event opened with a quick video presentation, as we learned (via N64-era, Ocarina of Time-style graphics) that Ganon had successfully destroyed Hyrule and trapped both Link and Zelda in crystallized prisons. A charismatic, bearded actor took the stage and gave us the rules: each table (of six) would have 60 minutes to solve the game’s puzzles. Beating Ganon would require us to figure out a series of Zelda-themed brain-teasers, like forming a map out of puzzle pieces and converting Hylian symbols into numbers. Other interesting puzzles involved cutting grass, finding a piece of the Triforce, and sticking an arrow through something you wouldn’t expect to stick an arrow through. Our table, complete with puzzles, gear, and the Master Sword that we won. My team solved all of the puzzles and got to the Temple of Time with just seconds to spare, mostly thanks to one of the other two ladies at our table, who said she “did a lot of escape rooms” and helped carry our team to victory. The final puzzle is particularly imaginative, and while I won’t spoil it for anyone who plans to play Defenders of the Triforce, I will say that I was surprised that something like 15 tables in my group were able to solve it. I enjoyed playing through this not-really-an-escape-room escape room, but that’s almost entirely because they gave me a free spot. Scrap charges $43 ($48 at the door) per ticket, which seems egregious to me. I would instead recommend buying a Switch and a copy of Breath of the Wild. At least there you’ll never run out of hats.